A Tiny House Future – this luminous life. June 9, 2011 July 24, 2012 ~ Laura N.
Growing up, one of my dreams was to become an architect. When I was a little girl, I drew elaborate house plans with dozens of bedrooms, bowling alleys, and movie theaters inside. I obsessed over Frank Lloyd Wright and his neat lines. I took an Auto-CAD class in high school. I loved The Fountainhead. I started playing The Sims just so I could create houses within the game. I drooled over million-dollar homes surrounded by ornate courtyards. I wanted big. Senior year of high school, I figured out I did not like math and my dream changed. I went off to college to study film-making and creative writing. Architecture took a back seat. My mind filled with splicing 35mm film and transcendentalism. This is where I fell in love with photography, was introduced to Thoreau, and briefly tasted sustainable living in an off-the-grid alternative housing option on campus known as the Homestead. Yet, I still had a dream of designing and building my own home in the future. Thanks to Thoreau and experiencing the Homestead, my ideal house shrunk in size as I now envisioned a log cabin in the woods with a giant stone fireplace. Since then, I decided I just wanted to live simply in a small space and save all my money for experiences and trips. I wanted to be one of those people that was secretly wealthy — living minimally with a huge savings account. Why bother collecting stuff when I could use the money to see the world? The same mentality is what attracted me to the minimalism movement when I stumbled across it (“There’s a name for this mindset? I’m not alone? Cool!”). I also discovered tiny homes and fell in love with them. For half a year now, I’ve been drooling over tiny homes. Tiny houses are homes typically under 200 square feet (think 8′ x 20′ with a loft), placed on a trailer. Jay Shafer has been designing and selling tiny homes for years. Drew and his wife are documenting their tiny home progress. Tammy Strobel and her husband will build their home this summer. Evan and Gabby are building a home now, a few hours away from me! The more I dived into the world of tiny house living, the more I discovered that dozens of people are living out their dream in a small home. My dream is to live simply and be active within the community and outdoors. Why bother with a large home and fill it up with stuff when I could downsize and truly live? Why keep paying rent for an apartment that doesn’t give me a return on my dollars? A tiny house is perfect. This was originally hard to explain to my fiancé. He’s not completely on board with the simple living thing. He wants a small home too, but envisions a modest ranch home with a furnished basement for a large, flat-screen television and a garage to house all his NASCAR memorabilia and tools. After much persisting, my enthusiasm for a tiny home finally wore off on him a couple months ago. He looked up tiny homes on Google, found some videos of Jay Shafer’s home and said, “I’m in. I could do this!” Needless to say, I was thrilled to hear that! We immediately dived into tiny home research. The past couple months, we’ve been sharing our plans with friends, family, strangers, and fellow writers and tiny home enthusiasts. Some people doubt our plans and think we’re crazy while others have been encouraging and excited for us. We have nothing concrete at the moment aside from browsing home improvement stores, some bookmarked websites, and sketches on papers. It is this lack of physical progress that gave me hesitation to write this post in case things fall through, but we re doing this! It will be our first major project as newlyweds and we aim to have it completed by our first wedding anniversary. Since our wedding is in October, construction of the house will hopefully begin early next spring. Tiny house progress will be documented extensively over the next year as we explore the research, planning, design, process, and lifestyle behind the home. We’ve already made decisions on a few things (which appliances to keep, what kind of toilet we want, the ideal size of the home, what kind of stairs to build to the loft) but still have many burning questions (where to build it, to buy or rent land, gas or electric, how to make room for our pets and keep the place odor-free, etc.)! I still want a log cabin. He still wants the garage. We might have this someday, after we’re lived in tiny house for a while. But for now, it’s time to focus on my biggest dream: designing and building my home. Or rather, our home. *Photo by Peter DaSilva for The New York Times. Next ›Life Lessons Learned At Camp: Bonfires, Pinky Swears, & Time. If I have learned one thing from our personal adventure and one thing about reclaiming our homes in America it is that we don’t have to sacrifice dreams. 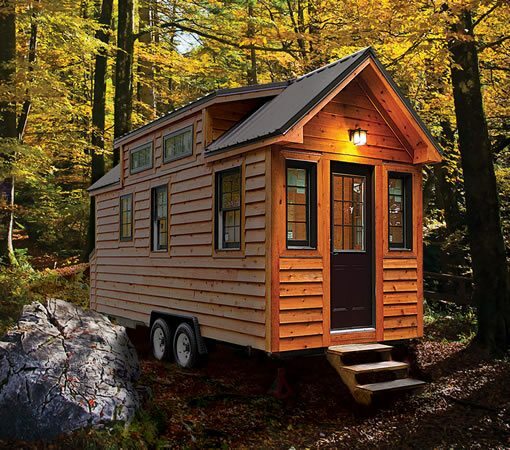 There is no square footage requirement for a home to be a tiny home. There is no template. The goal rather is to have a home that grows with you; an organic domicile. Too many of us build homes that we must consume in order to fill. Allow the experience to grow with you. If it brings you a NASCAR room or a cabin overlooking the mountains, so be it. The dream is yours! I wholeheartedly agree about the home growing with the person – too many people buy homes and then look around, wondering what to fill it with, and buying all sorts of extra stuff they don’t need. Just to fill space. It needs to be the other way around! I dare to dream about a world in which everyone has some kind of tiny house. Our tiny home will be log cabin-ish, and we’ll build a garage afterward to house vehicles, tools, and a workroom. I’ll be outlining this later. I like what you said: we do have chapters in our lives. This is just the beginning of a new chapter and will end at some point. I don’t want to grow old and look back, regretting not doing things. Now’s the time to do it! A book on living on raw foods!? Sounds like something I need to read. 🙂 Thank you for coming back again to keep me updated! I hope your busy life slows down soon so you can enjoy the things that truly matter to you. Cheers! This is really interesting. I have never heard of tiny houses. I think my bf would totally be on board for this. Me, on the other hand like big open spaces. I really like the idea though. I can’t wait to see how this story unfolds. I think it would be fun to have some land and several tiny homes on it. So people could visit and appreciate the simplicity of their accommodations while they stayed. Such a community does exist! Check out Third Street Cottages, a pocket community designed by Ross Chapin. These are very small houses built closely together to build community. What we need are more of these, whether as homes or vacation spots. I have been finding that more people are appreciating the simplicity of a tiny home as a weekend getaway. Can I just say, I’d be really happy with a set up like this. In fact, I may have to build one for my next place. I highly encourage thinking about it. Although I have to say, the whole artsy warehouse thing you’ve got going right now is pretty neat! Love your blog! Was blog hopping and am glad to have found it. Been without our ‘stuff’ for a year + now and am not looking forward to getting it back! I don’t know how anyone could stand getting stuff back once they’ve gotten rid of it. It’s so freeing!